The Safety Assessment Federation (SAFed) represents the UK’s independent engineering inspection and certification industry, which plays a key role in maintaining high standards of safety within the workplace. The organisation acts as a focal point for all issues and concerns relating to the safe use and operation of plant, machinery and equipment. The new SAFed guidelines were put in place following an industry increase in the use of pressure relief valves in applications that required a safety valve. These valves are commonly mis-used due to a perceived cost-saving solution by using pressure relief valves instead. The new guidelines set out by the Pressure Equipment Committee will help engineers avoid the occurrence of dangerous overpressure situations. The guide focuses on areas such as optimal set pressure, discharge capacity of valves and design temperature of valves. It also highlights the risks of using pressure relief valves instead of safety valves, a practice which has become increasingly common in recent years. In a pressurised system both safety and pressure relief valves are used as the last safety device. However, engineers and specifiers need to be mindful that the requirements can vary significantly from system to system, and increasingly valves must now meet the EU’s Pressure Equipment Directive (PED) 2014/68/EU to guarantee safety. * A pressure relief valve –the opening is proportional to increase in the vessel pressure. The opening of the valve is not sudden but gradual if the pressure is increased gradually. * Safety Valve –the opening is sudden. 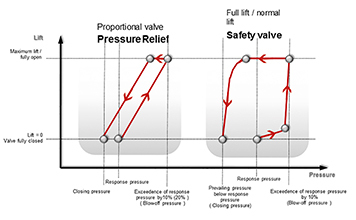 When the set pressure of the valve is reached, the valve opens completely. Understanding when to use the different types of valve is vital for engineers and installers, the summary below shows the key characteristics to bear in mind when making a selection. In a pressurised system, both safety valves and pressure relief valves were being used. However, engineers and specifiers now need to be aware that valves must meet the EU’s Pressure Equipment Directive (PED) 2014/68/EU to guarantee safety and avoid catastrophic risks associated with specifying the wrong valve when assessing overpressure protection. In applications where PED is applicable, it is mandatory to use safety valves with the appropriate approvals. If a valve without type test approval is installed there is no guarantee that the required blow-off at 10% would be reached, which poses a huge safety risk. Manufacturers must provide adequate instructions with equipment, complete a specified declaration of conformity and maintain a technical file of information about how the equipment was designed and manufactured. Pressure equipment must be marked with the manufacturer, unique identification of model and serial number, the year of manufacture, maximum/minimum allowable pressure limits and the CE logo. Tamperproof to prevent unauthorised adjustment of set pressure. Albion Valves have been supplying safety and pressure relief valves for several years and welcome the new guidelines issued by the Safety Assessment Federation (SAFed). We are here to help and advise with the new guidelines and aim to ensure that all engineers are meeting their insurance conditions and not making cheaper and potentially unsuitable options.